The Thai Chicken Seekh Kabab is a desi-Thai fusion recipe. The marinade is made from the best Thai flavours: coconut, chilli, and lime to name a few. Your Thai-loving guests will be coming back for more in no time. View the full recipe below! Combine all the ingredients in the blender or mini-food processor. Mix until you have smooth creamy texture. Marinade the chicken for 12 hours before skewering along with onions and pineapple. 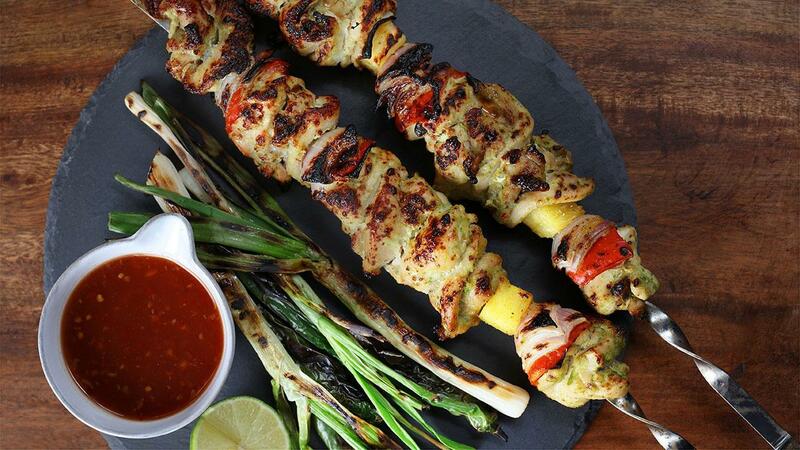 Serve the Seekh Kababs next to grilled spring onions.